There’s nothing better than cozying up next to a crackling fireplace when it’s cold outside. Make sure that you maintain your home’s comfort and safety in the upcoming winter season by having your fireplace serviced this fall. Homeowners are more likely to get their wood-burning stoves cleaned because of the accumulation of grime and soot over time. We want to stress the importance of servicing your gas fireplace as well. Both systems need an annual inspection to remain safe and functional. If you want great service for your fireplace in Clearfield, UT, choose our dependable team here at Rentmeister Total Home Service. Annual service is a necessary step in responsibly caring for your fireplace, but if you need extra convincing, here are a few concrete reasons why you should maintain your fireplace. The biggest reason that homeowners have their fireplaces serviced is for safety reasons. A fireplace isn’t an inherently dangerous element in your home, but it can be if you let it go unmaintained. Most fires that start because the fireplace hasn’t been properly maintained. There are many fireplace problems that can contribute to potential hazards. You need a professional to clean and properly maintain your system whether it is a gas or wood stove. This part of an annual service is particularly for wood-burning fireplaces although gas burning fireplaces do need cleaning. Wood burning fireplaces are susceptible to creosote buildup. Creosote is a toxic and highly flammable byproduct of burning wood. It needs to be cleared as soon as possible if it’s present in your chimney. When creosote ignites, the fire quickly becomes out of control. The exposure to smoke to creosote is also a problem because it’s harmful to the lungs. The best way to ensure that your chimney and fireplace doesn’t have buildup is to have a professional from our team work for you. We’ll come out, assess your system, clean, and test your fireplace so you’ll know you’re ready all winter long. Both wood burning and gas fireplaces need routine maintenance to ensure that they’ll be able to function. Taking care of your fireplace involves more than you might think. The inspection of your fireplace is the most important part of routine maintenance. Our fireplace technicians provide comprehensive inspections that will give you peace of mind. We service a variety of models including wood stove inserts, gas stove inserts, wall-mounted, and stand-alone fireplaces. Fall is the perfect time to have your fireplace services. 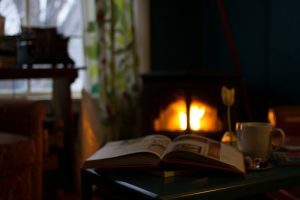 Temperatures are already cooling off here in Utah so doing this now will help you enjoy your fireplace all winter long. Even if you have a gas fireplace and feeling more secure because these types of fireplaces are typically cleaner burning than wood burning, you still need routine maintenance. Don’t procrastinate—schedule your service sooner than later. If you need thorough fireplace services here in Clearfield, contact our team to schedule an appointment today.